New research from nScreenMedia (my weekly podcast partner Colin Dixon's firm), has found that among pay-TV cord-cutters, 37% said they were "extremely happy and will never go back to pay-TV," with another 47% saying they're "pretty happy with the decision." Conversely, 8% said they were "pretty unhappy with the decision" and 9% "hate it and wish they had the service again." The overwhelming lack of remorse suggests cord-cutters have been able to cobble together mostly adequate OTT substitutes to pay-TV. The top 17 U.S. broadband ISPs added nearly 1.2 million subscribers in Q1 '14, notching the best quarter of growth since Q1 '12 (see chart below). These ISPs now have 85.5 million subscribers, with top cable operators accounting for nearly 59% or 50.3 million and top telcos accounting for 41% or 35.2 million. The data is according to Leichtman Research Group. The top cable operator ISPs garnered 83% of the quarter's 1.2 million subscriber additions, vs. just 17% for the telcos. This compares with Q1 '13, when the top cable operator ISPs took 72% of net additions, with telcos taking 28%. LRG notes that Q1 subscriber additions historically account for more than Q2 and Q3 additions combined. The 17 largest broadband ISPs in the U.S. added over 2.6 million subscribers in 2013, down almost 105K vs. the approximately 2.7 million subscribers they added in 2012. These ISPs now have 84.3 million subscribers, with cable TV operator ISPs having 49.3 million (58%) and telco ISPs having 35 million (42%). The data comes from Leichtman Research Group. The data comes from Leichtman Research Group, which has tracked the top pay-TV operators' video subscriber numbers for years. Digitalsmiths has released its quarterly survey on consumer behavior around pay-TV and VOD, finding that consumers are continuing to “cord cheat,” with 48% supplementing their pay-TV subscriptions with OTT services, up from 35% reported in Q2 '13. Most popular for these consumers was Netflix (42%), while for individual movie rentals Redbox kiosks took the lead at 17%. Digitalsmiths believes cord cheating is a big threat to pay-TV providers and said they must adapt and better support consumer expectations. According to the survey, the top reasons consumers are choosing OTT services like Netflix, Hulu or iTunes are because they are more convenient (53%), cheaper (48%) and allow full season TV viewing (31%). There is a lot of talk these days about pay-TV cord-cutters and cord-nevers and how OTT providers can leverage this group to build their businesses. But a data point from research firm Leichtman Research Group last week that caught my eye suggests this market may be smaller than many people think and also not growing very fast. LRG noted that just 9% of U.S. homes subscribe to a broadband Internet service, but not a pay-TV service, up just slightly from the 8% level in both 2011 and 2012 (see graph below). Further, Bruce Leichtman of LRG told me that of the broadband/no pay-TV group, just 37% get their broadband from speedier and pricier cable or telco fiber deployments. That compares with 75% taking these services among other broadband subscribers (remember than cable and telco fiber are by far the most prevalent broadband services). New industry data compiled by Leichtman Research Group shows that broadband ISPs that account for 93% of the U.S. market added over 1.1 million subscribers in Q1 '13, nearly 6 times the 194K pay-TV subscribers that were added in the period by pay-TV operators that account for 94% of the market. Broadband subscriber additions have outstripped pay-TV's for years, but the 6x ratio is more than double the average of 2.8x from the prior 2 years. The 194K pay-TV additions in Q1 were down 56% vs. the 445K added in Q1 '12, while the 1.1M broadband additions were off 15% from the 1.3M in each of the prior 2 years. On the surface the data suggests that cord-cutting - a shift from viewing video via pay-TV to via broadband - may finally be taking hold. But while LRG's Bruce Leichtman has indeed found an uptick in his calculations of cord-cutting (up from .2% of U.S. homes to .4%-.5%), he sees a far more nuanced picture of what accounted for Q1's swing, plus lots of uncertainty going forward. New research from The Diffusion Group forecasts that the number of "pay-TV refugees" - U.S. homes subscribing to broadband, but not to pay-TV services - will increase 58%, from 10.9 million in 2012 to 17.2 million in 2017. Pay-TV refugees consist of both "cord-cutters" (homes that once subscribed to pay-TV, but no longer do) and "cord-nevers" (homes that have never subscribed to pay-TV). The percentage of broadband subscribers who are pay-TV refugees will increase from 12.5% in 2012 to 17.2% in 2017. Although it forecasts the number of cord-cutters to increase over the next 5 years, TDG's founding partner and director of research Michael Greeson believes the pay-TV industry's main concern should be with cord-nevers which will more than double during that period. Of the 17.2 million pay-TV refugees in 2017, TDG forecasts 40% or 6.9 million of them to be cord-nevers, up from 29%, or 3.2 million, in 2012. How About Some Actual Data in the Cord-Cutting Debate? No sooner did SNL Kagan's press release, announcing that the U.S. pay-TV industry had lost 119K subscribers in Q3 '10, following a loss of 216K subscribers in Q2, hit the wire today, than the blogosphere was alight with a fresh round of posts that cord-cutting was to blame. This chorus was surely egged on by Kagan senior analyst Ian Olgeirson's remark in the press release that "it is becoming increasingly difficult to dismiss the impact of over-the-top substitution on video subscriber performance." That remark was a notable change of tone from Kagan's Q2 release which ascribed subscriber losses solely to the country's ongoing economic woes. Note however that Olgeirson only offered his opinion, rather than any actual, hard data from Kagan about cord-cutting's impact. That is characteristic of both sides of the current cord-cutting debate - lots of opining, but little-to-no reliable data. In my own Q3 analysis - in which I suggested that the pay-TV as a whole likely lost around 97K subscribers in Q3 (though the group of 8 of the top 9 pay-TV operators actually gained subscribers) - I noted that nobody truly knows the impact of cord-cutting, yet anyway. Research firm SNL Kagan is reporting today that the U.S. pay-TV industry (cable/satellite/telco) lost 216,000 multichannel TV subscribers in Q2 '10, the first time the industry as a whole has lost subscribers. Cable operators bore the brunt of the losses, dropping 711,000 subscribers, with Kagan saying 6 of the 8 operators reporting suffered record quarterly losses. 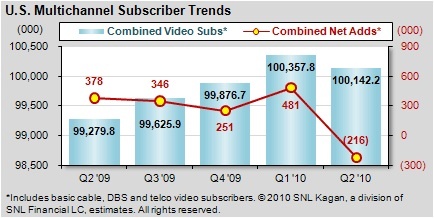 By contrast, telcos added 414,000 subs in the quarter and satellite providers gained 81,000. The losses leave cable's industry share at 61%, down from 63.6% a year ago. Kagan analyst Mariam Rondeli ascribed the quarterly losses to low housing formation and high unemployment due to the ongoing recession, coupled with churn due to promotions from last year's broadcast digital transitions expiring. Rondeli pointed out that over-the-top video alternatives were not the cause. By comparison, the pay-TV gained 378,000 subscribers in Q2 '09, meaning there was a swing of 594,000 subscribers year-over-year. U.S. Pay-TV providers as a whole ended Q2 '10 with 100.1 million subscribers. Looking ahead, I've heard some murmurs that Q3 '10 could be softer than in prior years, again partially due to the recession, but also because seasonal college students' subscriptions may be reduced due to over-the-top alternatives. While we've yet to see any tangible evidence of cord-cutting, the first impact may simply be slower multichannel sign-ups from younger users more accustomed to watching online. We'll see.